The French fleet, under Admiral Comte d'Estaing, consisted of 25 ships of the line and several frigates. The British fleet, under Vice-Admiral John Byron, had 21 ships of the line and 1 frigate. The French were anchored off St. George's Town on the south-west of the island, and the English approached during the night. D’Estaing weighed at 4 A.M. and Byron chased. 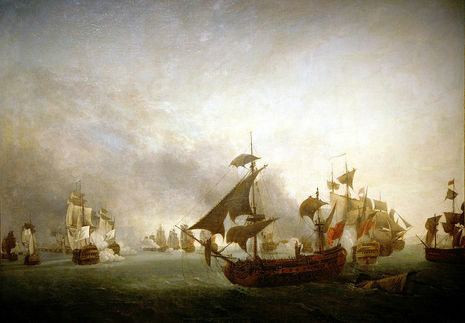 The British ships attacked in utter disorder and confusion. Fame, Lion and two other ships got separated from the main body, and were very badly mauled. Lion was forced to run downwind to Jamaica to avoid capture. The French lost no ships and eventually hauled off. The British lost 183 killed and 346 wounded. Fame lost 4 killed and 9 wounded. The French lost 190 killed and 759 wounded. The war now died down in the West Indies. Byron returned home in August. D'Estaing, after co-operating unsuccessfully with the Americans in an attack on Savannah in September, also returned to Europe.